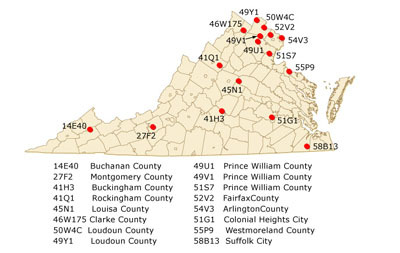 Streamflow-duration plots now available for Virginia. The real-time data used to produce this map are provisional and have not been reviewed or edited. They may be subject to significant change. The map depicts streamflow conditions as measured at USGS gaging stations. The colors represent discharge as a percentile, which is computed from the period of record for the current day of the year. Only stations having at least 30 years of record are used. These maps show the 7-day average streamflow conditions in hydrologic units of the United States and Puerto Rico for the day of year. The colors represent 7-day average streamflow percentiles based on historical streamflow for the day of the year. Thus, the maps show conditions adjusted for this time of the year. Only stations having at least 30 years of record are used. Subregions shaded gray indicate that insufficient data were available to compute a reliable 7-day average streamflow value. During winter months, this situation frequently arises due to ice effects. The data used to produce these maps are provisional and have not been reviewed or edited. They may be subject to significant change.